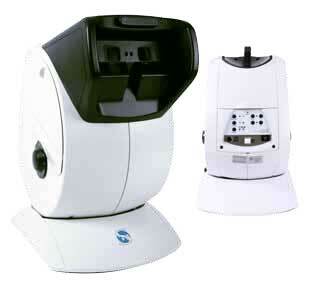 Stereo Optical, Inc. has created the Optec® 5000 and 5000P to perform comprehensive visual screening in minimal time. In addition to the ability to screen under a variety of conditions, including monocular, binocular, near, distance, daytime, and nighttime, the Optec® 5000P can also function as a peripheral vision test. The 5000 and 5000 P models are lightweight, portable, and feature a convenient light-emitting diode (LED) lighting system. Adult and pediatric visual acuities, color and depth perception, as well as vertical and lateral phorias can be tested using the Optec® 5000 and 5000 P. These visual screening devices conduct simple, accurate, and repeatable tests in less than five minutes. The Optec® 5000 and 5000P boast unsurpassed homogenous illumination, two independent viewing ports for distance (20 feet) and near (18 inches) testing, and a washable, scratch-resistant surface made from Acrylonitrile Butadiene Styrene (ABS) plastic. The Optec® 5000P comes with a manual control, accessories kit, one standard slide package, and a peripheral vision test. Uncomplicated test sequence that requires only five minutes for ancillary office staff to conduct. Your choice of standard vision testing slide packages intended for a variety of specialty areas, including ophthalmology, optometry, public health, schools, clinical trials, driver licensing, and more. A distance/near lens system with two separate viewing apertures for accurate distance and near testing (20 feet and 18 inches, respectively). Testing between near and distance is also available in 20, 22.5, 26, 31.5, and 39.5 inches. Custom slide packages include Ophthalmic Prescreening, Driver Rehabilitation, Medical with H.O.T.V., Medical with Michigan Preschool, Industrial with Purdue Job Standards Book, and the International with Job Standards Book. With Manual Control and Accessory Kit. With Manual Control, Peripheral Test and Accessory Kit.